Breaking into a yuletide rendition of your favourite festive carol could be the latest weapon in the battle against breathlessness. Melody Mills (yes, that’s her real name!) reports on the benefits of singing as therapy. Whilst medical therapy continues to play a big role in supporting those with pulmonary hypertension, many patients feel they need further strategies to help reduce the life affecting severity of their symptoms. The humble act of singing is now believed to be amongst the most powerful of these strategies – hailed by doctors and patients alike for its ability to reduce symptoms and boost general health and wellbeing. If you’re still left wondering whether exercising your larynx with your favourite song can really help you, scientific research appears to confirm the potential benefits. A study funded by rb&hArts, the arts programme at Royal Brompton and Harefield hospitals, found some evidence to suggest that singing lessons may be of benefit for patients, but it was initially unclear whether it was the singing or the fact that patients were taking part in a group activity that was making the difference. So under further research, patients attended either a singing class or a film club for eight weeks. The results were compelling. All participants in the singing group reported positive physical effects in relation to their breathing after attending the singing group. In particular, they reported being more aware of their breathing and how to control it more effectively. Participants felt that they had achieved something both personally and physically. In comparison, those attending the film group felt that there had been little benefit in attending the group. In fact, they all asked to enrol onto the singing classes! All participants in the singing group reported positive physical effects in relation to their breathing after attending the singing group. But why did the study findings come out so clearly in favour of the singing? Well, learning to sing requires plenty of breathing and posture control. Even the world’s most famous singers spend hours on techniques to control their breathing. It’s only natural therefore that the benefits of vocal coaching should be felt by those suffering from breathlessness as well. Then there’s the obvious psychological benefits of singing in a large group and achieving something as magnificent as making music together. 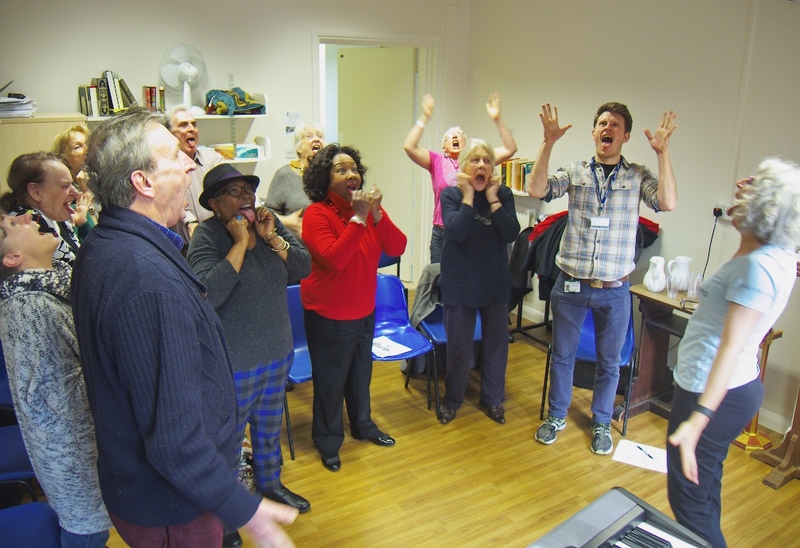 With the benefits of singing proven, a ground-breaking singing workshop for patients with PH, and also COPD, was established, benefitting hundreds of people living with breathlessness. Royal Brompton and Harefield NHS Foundation Trust’s Singing for Breathing is a flagship project which supports people living with chronic lung and heart conditions or who experience breathlessness. The workshops include relaxation techniques, breathing exercises and vocal exercises, as well as singing a wide range of songs – often chosen by the participants themselves. 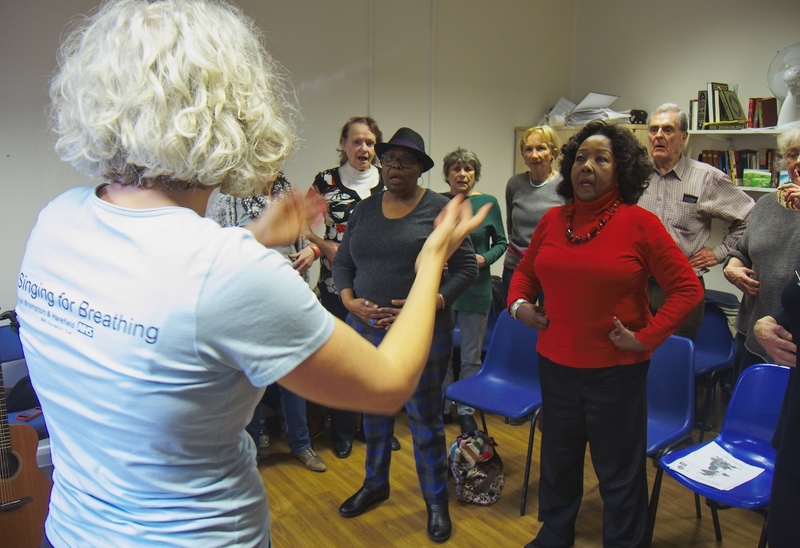 In 2008 Singing for Breathing, a charity-funded initiative, was one of just two such projects in the country but there are now more than 50 Singing for Lung Health classes nationwide, with more springing up all the time. rb&hArts has continuously delivered workshops for almost a decade, supporting hundreds of people through vocal coaching. Karen Taylor runs Singing for Breathing workshops at Brompton and urges anyone experiencing breathlessness to give singing a go. She said: “If I had a pound for every time someone told me they couldn’t sing, then I’d be a very rich woman. I always try to encourage people to give it a try. There’s something magical about singing in a group – it’s so obviously beneficial to general health and wellbeing, but it also makes it easy to make friends with like-minded people. The emphasis of the workshops is on taking key elements from how professional singers develop and exercise their vocal chords to prepare the body for singing, and tailoring them to benefit people experiencing breathlessness. “The types of songs we sing are really varied from chart hits like ‘Something Inside So Strong’ to classic songs like ‘Summertime’ and musical numbers like ‘Oh What A Beautiful Morning’. There’s something so incredibly spiritually uplifting about singing in a group. People sing in all aspects of life, often without really thinking about it – whether it’s at the football, at church or even on a political rally. Jay and the rest of his class took part in a Christmas concert at a local church last year, which was a big moment for the group. This year the singers are preparing for two ‘Carols by Candlelight’ services at a local church. If you are interested in taking part in the Singing for Breathing workshops around Brompton, they take place on Mondays in Harefield (Village) Library, 11.15am or Tuesdays at 11am in Fulham Wing at Royal Brompton Hospital. Sessions are free, but a donation is welcomed. For more information, visit www.rbht.nhs.uk/about/arts or contact the arts team directly on 0207 352 8121 ext 4087, or email arts@rbht.nhs.uk. To find singing opportunities close to your area, talk to your PH team, ask at your local GP surgery, or visit the British Lung Foundation website, on https://www.blf.org.uk/support-for-you/singing-for-lung-health/join-a-group.